FINALLY I have time to blog! 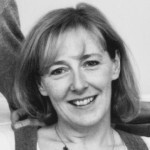 I know it’s a fabulous privilege to be able to spend time creating artwork for children’s picture books, (especially when it’s for the latest, truly beautiful story by Mark Sperring, which OUP will publish next year – sneak a peek on my FB page! ), but usually the work makes me put everything else on hold. That’s why I felt doubly guilty a few weeks ago. 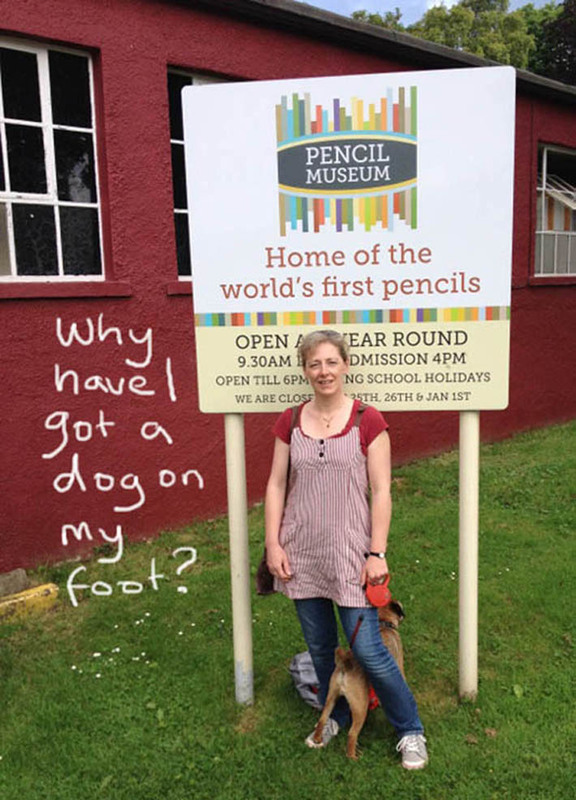 Not only did I take a couple of days away from work to stay with good friends in the Lake District, but I also snuck away from said virtuous, hill-walking friends to visit the Pencil Museum in Keswick. 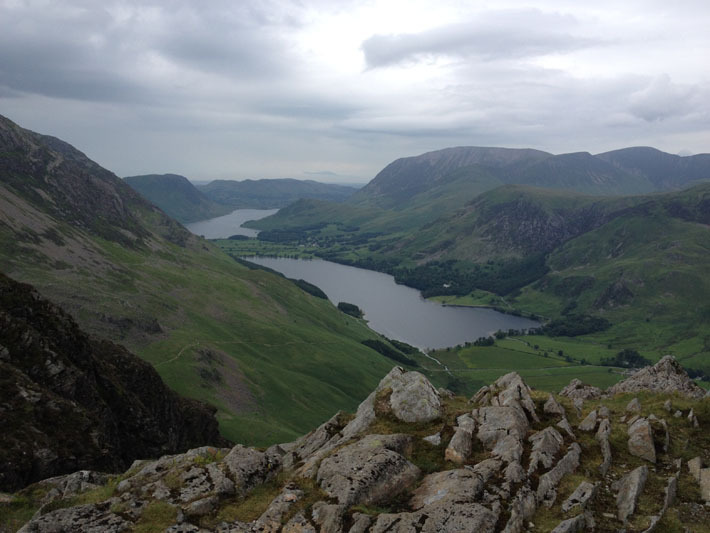 I think this is one of my favourite places on earth. The museum’s exhibit explains everything you could wish to know about graphite mining and the history of pencil manufacturing in the area, including some specialist gadget pencils used by secret agents during World War II. They boast the world’s first and the world’s biggest pencils, and there are great work sheets available, to keep kids of all ages engaged. It’s all pretty fascinating, even if you’re not a complete pencil nerd like me. 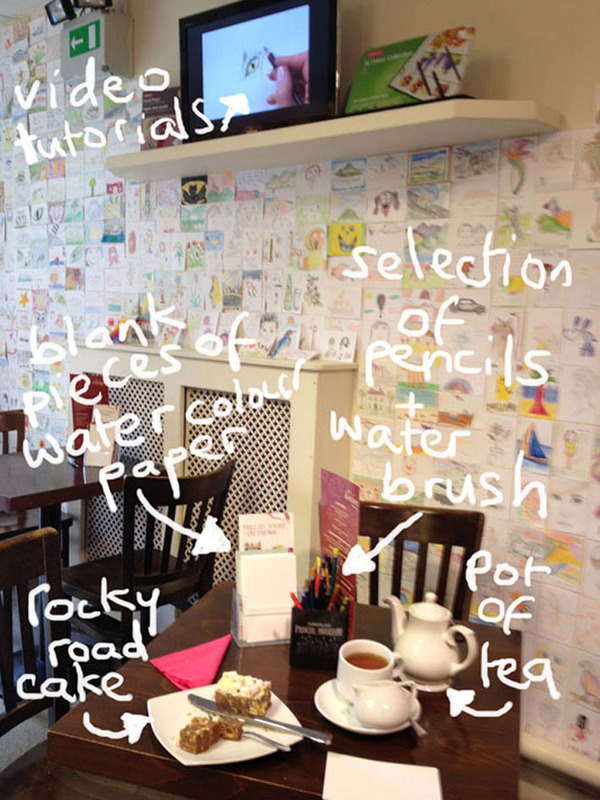 But for me, the best thing about the Pencil Museum is the shop/café/art room area, which you can access free of charge. 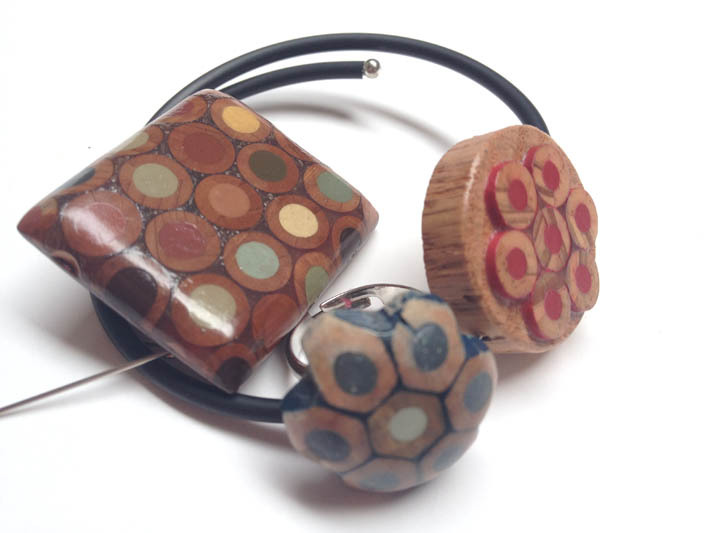 The shop sells some gift items, such as articles made by ace upcyclers Zincwhite (they use off-cuts from Derwent pencils for some of their jewelry designs) and lots and lots of lovely art materials. My fingers get twitchy at the thought! Now I never intended making a huge plug for Derwent pencils here, but since my favourite Karisma coloured pencils are no longer sold, and their replacement Prismacolor are hard to find, I’ve had to look for an alternative. 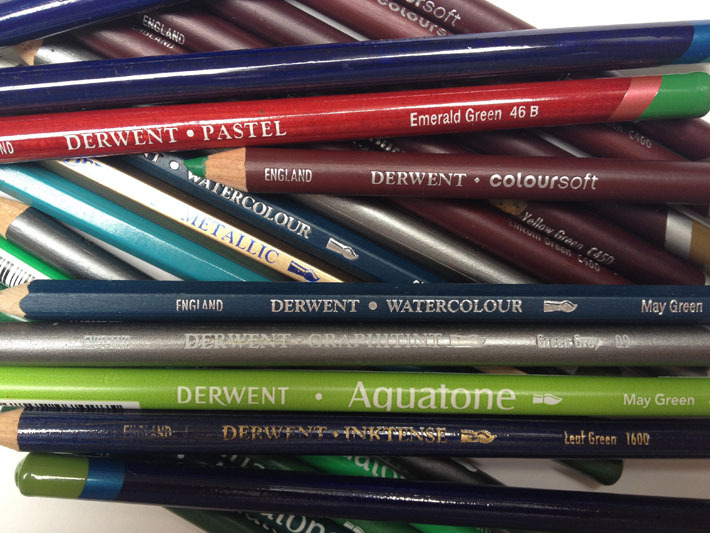 Derwent Coloursoft have been perfect, with the added advantage that many art shops sell them individually. Browsing in the pencil museum shop, I suddenly realized that, as well as Coloursoft and traditional graphite pencils, I already use plenty of other Derwent products: pastel pencils, water-soluble pencils, charcoal pencils, metallic pencils, and the gorgeously bright Inktense range. These, as the name suggests, are made from ink, so the colours are permanent and can be used on fabric as well as paper. They now come in block as well as pencil form, so they can be applied with a point or on their sides, or even used for stamping, apparently. 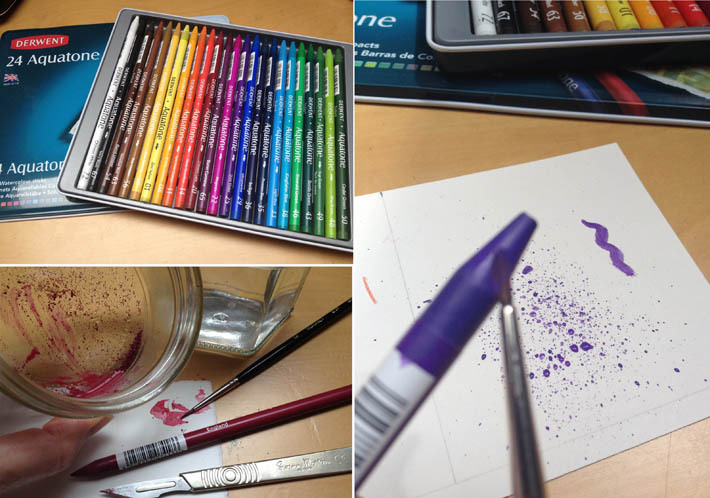 When you add water to Inktense, the colours are almost shockingly, well… in(k)tense. In short I was in ecstasy over the pencilware… and agony over having to choose which to buy. The shop staff waited patiently while I dithered, giving me enthusiastic advice whenever I asked. In the end I had to shuffle over to the café for sustenance – and I honestly believe there is no better café for a pencil-obsessed illustrator. Every table is set with sample materials, so you can doodle while you drink. I forgot to take a photo of the contented mouse I drew with a slice of Rocky Road cake, but I gave the little pic with thanks to the lady who served me, because she was so kind. (Knowing I couldn’t eat the whole cake in one go, she brought me a small paper bag to take the rest home in.) And while I drank and ate and drew, I received a constant gentle stream of technical advice from tutorial videos playing on a screen on the wall. The walls are covered in pictures left by visitors, many of them children. Beside the café and shop, the museum also has a small, dedicated art and craft space, where they run arty events, some of which are especially for kids. It occurred to me that it might be a great venue for local picture book illustrators to run children’s events, if the museum were keen on teaming up. I only wish I lived close by. 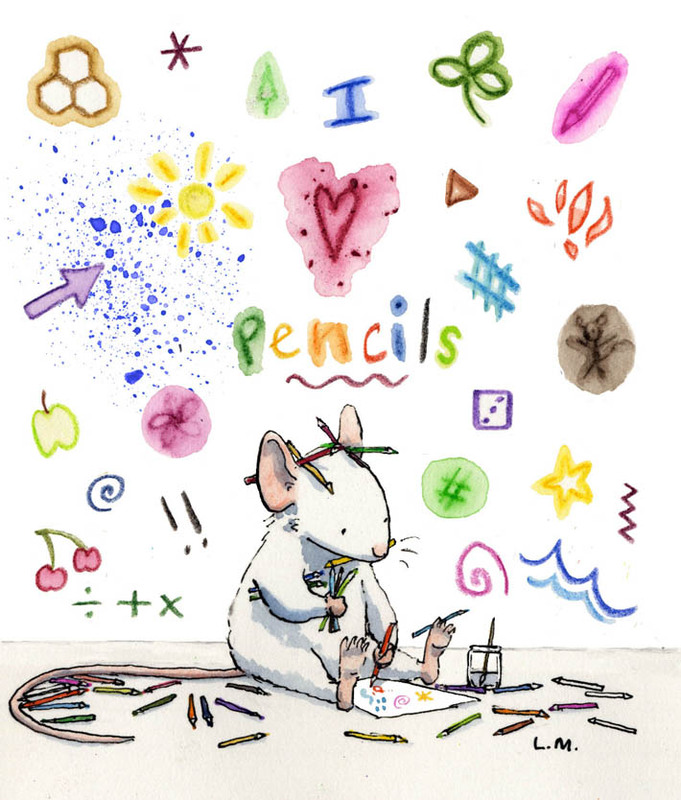 All this playing put me in mind of the inspiring Bridget Strevens Marzo, whose utterly glorious picture book Tiz and Ott (about two young, mark-making, animal friends) will be published by Tate in 2015. 2 Pings/Trackbacks for "Being a Pencil Nerd"